University of Maine at Presque Isle professor Dr. Chunzeng Wang led a group of students from the Environmental Studies and Sustainability Program on an overnight field trip to the mines in Bathurst, New Brunswick, Canada, in late October. The trip gave them a first-hand glimpse of metal ore deposits, underground mining, and mine waste treatment, showed them the ins and outs of a large-scale mining operation, provided them with an up-close look at some of the rocks and deposits they’ve been studying, and let them see up close some of the environmental issues that come with mining and ways of dealing with them. Ahead of the trip, Dr. Wang, Associate Professor of Geology, Environment, and GIS, provided lectures on mining and geologic hazards with mining. Another unique preparation was in order for students with beards – the company required that everyone who entered the mines be clean shaven. This precaution is taken to ensure that, in the event that there is an emergency underground requiring oxygen, the facemask would seal correctly. The group departed for Canada on the afternoon of Oct. 25, and then got as much sleep as possible before their early morning wakeup call. 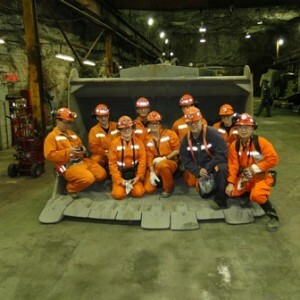 James Cormier, Superintendent for Environment and Community Affairs at Xstrata Zinc that owns and operates the mine, met the group at 5 a.m. (Eastern Standard Time) to lead them on a day-long tour of the Brunswick Mine (Bathurst Mining Camp). The mine is located in northeastern New Brunswick, about 20 kilometers southwest of Bathurst. Its #12 mine is the world’s largest underground zinc mine and the fourth largest zinc producer. The mine also extracts copper and lead. Before descending underground, the group was provided with mining coveralls, steel toe boots, hard hats, safety glasses, head lamps with battery pack, and an emergency rescue kit including a 30-minute supply of oxygen. Everyone viewed a training video with instructions on how to use the rescue kits before heading to the elevator shaft. The group rode the elevator with about 40 mine workers on their way to begin their day shift. After several stops at various levels, the group reached the level of their tour at 850 meters (2,788 feet) underground. Various stages of the mining process were visited as the group walked through tunnels bored through the solid rock. In addition to Cormier, a geologist and a mining engineer guided the tour and answered questions as the group examined the geology of the mineral deposit, a typical VMS-type (volcanogenic mass sulfides) zinc-lead-copper deposit. The group collected ore and rock samples and photographed important geologic features. Many sections of tunnel had no lighting and the headlamps were necessary to navigate safely. Leaving the darkened passages of the tunnels, the group entered into two huge, brightly lit caverns that had been excavated and outfitted as fully equipped shops used to maintain underground mining equipment. In this spot, members of the group said they found it hard to believe that they were really so far underground. The morning underground tour was followed by a lunch provided by the mine. At the lunch, another mining geologist met the group and Cormier gave a presentation on the mine’s history and plans for the mine’s closing beginning in March 2013. According to Cormier, the mining company has set up a total of $80 million in funds for the closing and reclamation. In the afternoon, the group explored the mine’s #6 open pit, a 600-foot-deep, water-filled, crater-like pit which was in production between 1966 and 1983. Workers are still treating the acid rock drainage from this site. The UMPI group also toured the mine’s surface operations, tailings disposal areas, and the modern tailing water treatment plant for the #6 and #12 mines. The group was impressed by the modern technology used to treat the tailing waste water. At day’s end, Cormier pointed out that the mining company rarely arranges tours like this, but that officials were impressed with the UMPI group’s questions and professionalism and would welcome them back in the future. Wang said the trip was a great opportunity for his students to learn about the geology of metallic ore deposits, modern metallic ore mining technology, and mining waste treatment, as well as careers as mining geologists, environmental technicians, and mine operations managers. 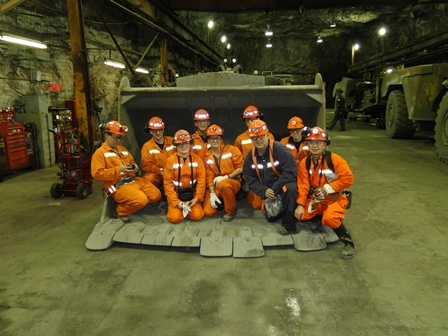 “After having lectures about mining in class, the opportunity to see such an operation firsthand was very valuable and the underground tour was an experience that I will never forget,” said Scott Belair, an UMPI student who participated in the trip and will graduate this coming spring.